Pictured here is Katrina Haslip, an HIV-positive, formerly incarcerated Black Muslim woman who was known to raise awareness about how women were uniquely affected by HIV/AIDS. Along with the mobilization of other HIV/AIDS activists, Katrina pressured the CDC to broaden its surveillance definition of AIDS to include conditions faced by women. 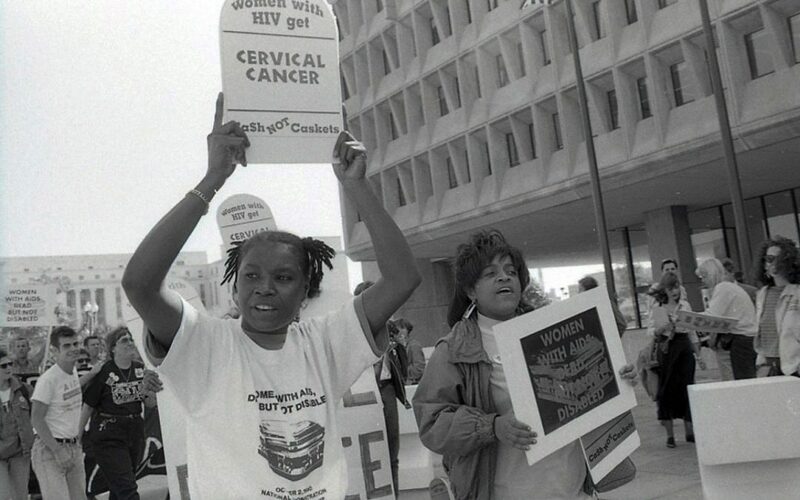 This image is taken from the recent documentary Nothing Without Us: The Women Who Will End AIDS, by director Harriet Hirshorn and distributed by Women Make Movies. In writing this post, I honor and remember the memories and lives of those living with HIV and those who have transitioned. I stand on/alongside/with the labor of those who have worked to amass resources and political will to mobilize against the pandemic. I embrace the space to connect theory and practice, to apply research to informed social action, to leverage institutional power to address HIV/AIDS in communities of color, particularly Black communities. To (re)imagine anew, how we live, love, and organize. As I waited at a bus stop in Ypsilanti on Monday, I was pleased to be greeted by an older white woman in a wheel chair who was also waiting for the bus. After asking about my day, she inquired about my doctoral research. I smiled before briefly explaining my health humanities work on HIV and Black women’s organizing. As she recalled her experience as a nurse in the 1980s, she explained how early medical responses to the disease largely characterized it as a “gay disease.” She concluded our exchange with a familiar response: “haven’t things gotten a lot better with that disease?” Her question exposes the narratives of progress about HIV/AIDS that often mask the entrenched racial and gender disparities in current responses to the pandemic. This question haunts HIV/AIDS researchers, like myself. It is also rooted in historical health inequities and racialized sexism that have continued to shape responses to the epidemic. As the country commemorates National Black HIV/AIDS Awareness Day in the widely celebrated month of Black history and on the heels of National Women’s Month, we approach a crossroads. In the wake of breakthrough biomedical developments that aim to reduce the spread of HIV transmission, the pandemic continues to disproportionately impact the poorest and socioeconomically disadvantaged sectors of the population. HIV remains an epidemic of overlapping inequalities that undermines the health and futures of people of color with enduring impacts on families, communities, and societies. Yet, women of color, and especially Black women, remain neglected in most interventions, research agendas, and funding. The failures of Black people in general, and Black women in particular, to share in the medical and technological advancements of HIV/AIDS leads me to ask: Whom does the progress narrative of the “end of AIDS” serve, and what does National Black HIV/AIDS Awareness Day mean for a student researcher? Recognizing how Black communities, particularly Black women, matter to HIV/AIDS. In the United States, although there has been a steady decline in HIV infection rates among women, African American women account for 61% of new HIV diagnoses. Despite the disproportionate impact of HIV/AIDS on Black women, this group remains less researched, less funded, and less engaged. Prioritizing holistic health approaches (rather than solely biomedical interventions) to this pandemic that pay careful attention and honor to the lives such women lead. What we do know is that HIV does not merely impact bodies, but rather whole lives with enduring impacts on individual psyches and life trajectories as well as communities and societies. Leveraging the value of the health humanities in contributing cultural knowledge to the science of the disease and the experience of illness. This involves integrating the lived experiences of people living with HIV with academic work to create evidence-based counter narratives to mainstream discourses about health inequities and HIV/AIDS. Centering people who live with HIV in decision making processes at all levels—grassroots, organizational, institutional, and societal. When it comes down to it, we know remarkably little about how everyday Black women live with HIV, despite the fact that it can be socially stigmatizing, physically deteriorating, emotionally debilitating, and potentially lethal. We know even less about how they respond to the pandemic by organizing on behalf of their own needs, desires, and interests. Leveraging Ph.D. training to shape research-informed social and political action beyond the spaces of academia. This involves developing and implementing community engaged practices around organizing and resource mobilization in order to connect the holistic health needs of marginalized communities to the heterogeneous networks of scholars, educators, policy makers, movement-builders, and more.